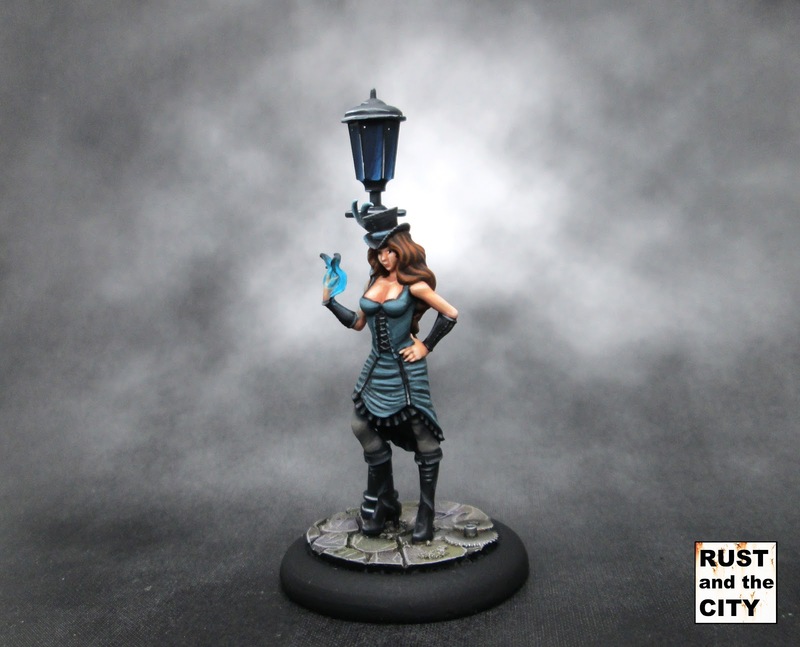 For the last few months I've mostly been painting entries for Iron Painter. I've played a lot of games with Ramos in the last few months and I wanted some variety. 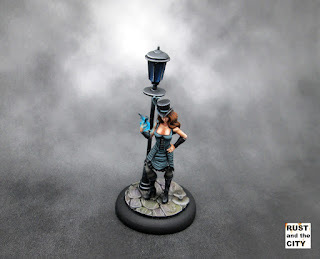 I used Colette only base coated one game. I try not to play with unpainted models so I worked on her last week to get her fully painted. 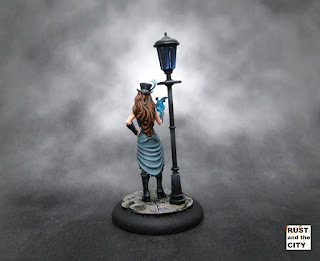 The models are from the new(ish) Smoke and Mirrors box. I think this sculpt of Colette is a big improvement on the slightly garish metal Colette. I do wish she were showing less skin than she is though. For Colette I decided to try a new variation on my new favorite color, P3 Coal Black. I also used Coal Black on the pirate jacket for my Iron Painter entry. This time I mixed it with white for a slightly bluer color. Because I used Coal Black in the dress I highlighted the black accents with Vallejo Model Color German Grey and Vallejo Game Color Cold Grey. I worked hard to keep the transitions smooth on the flesh. The most fun part to paint was the semi transparent stockings. The lamppost was fun too. The performer I painted to match the Vallejo Game Color Falcon Turquoise on the rest of my Arcanist models. I'm getting a little bored of painting it but I have only two showgirls left to continue this theme on. The performer was really difficult to photograph for some reason. I've been having issues photographing models lately. Camera issue? Most likely just operator error. 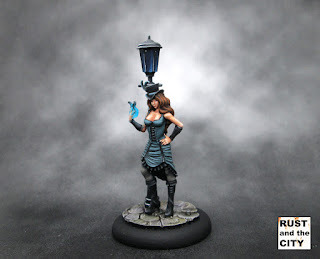 I'm signed up for the Wet Coast GT Malifaux tournament in Vancouver, BC in July. I'd like to have the rest of the Colette crew finished for the tournament. I'd like to paint a performer, mannequin, and large arachnid by then. I've played two games with Colette so far. Prompt is very powerful. All the scheme marker generation is fun too. Very different play style compared to Ramos. As always, thanks for visiting my little corner of the internet. 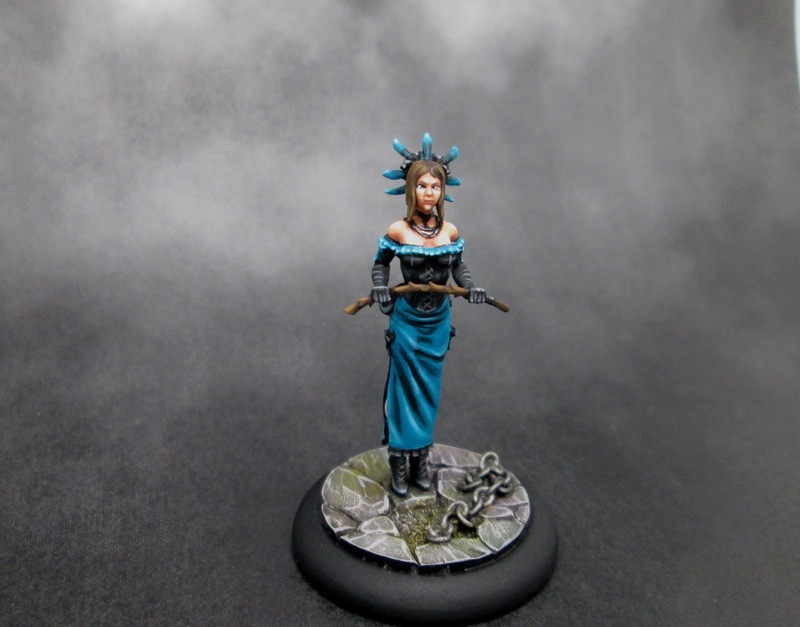 In the next few weeks I have another Iron Painter entry and a few more showgirls to finish painting. As always, your comments and thoughts are greatly appreciated! Thanks! I was pleased with how Colette turned out. Strange. Colette is painted to your typical good standard, but the sculpt for her face is pretty bad. Looks more like a man than a woman from here. The performer though is a far better sculpt. Colette's face is a different shape. Very kind of almond pixie shaped. It's a bit funny too as the hair has so much volume it sticks out a lot so the face was hard to reach to paint. The performer face is a decent sculpt. Tiny eye area details to paint though. I couldn't get the camera to focus right on it for some reason. I live in the okanagan (interior of BC) now. I used to live in Vancouver.